Japanese teen part-timer sporting a black-and-white street style w/ layered clothes, platform boots, crossbody bag, lace gloves and accessories. Harajuku girls in contrasting kawaii & all black fashion with orange sweater, pink skirt, aqua sneakers, Pac-Man t-shirt, black skirt, socks over fishnets, platform sandals, kawaii accessories, distressed denim cap & o-ring necklace. 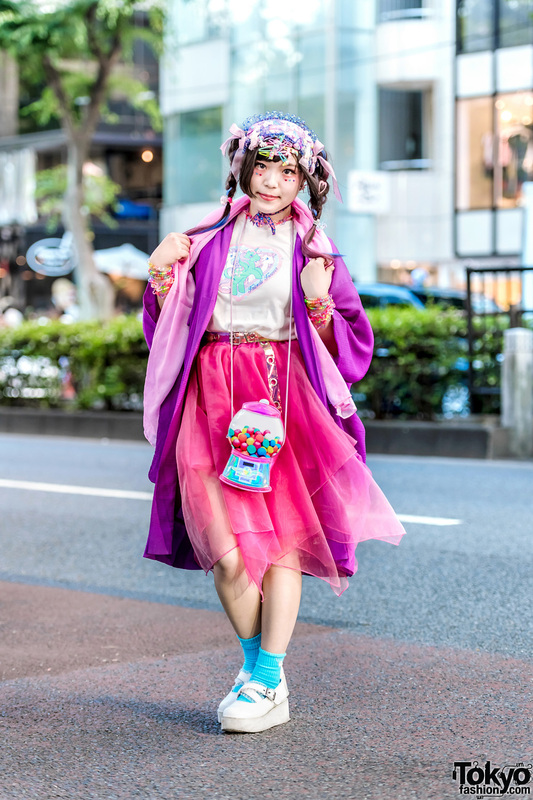 Japanese student showcasing subdued kawaii fashion in Harajuku. Japanese artist on the street in Harajuku with a plaid heart dress, fishnets, ruffle socks, pastel platforms and a clear backpack. Harajuku girl in long sweatshirt, jeans, backpack, heart bracelet and black boots. Harajuku girl with pastel bob hairstyle and cult party-inspired makeup, vintage fashion, and Tokyo Bopper ribbon laced platform shoes. Blonde girls wearing pastels in Harajuku, with pink coat, cartoon print dress and bag, platform ankle boots vs. camouflage print with denim jacket and ballet flats. Friendly English-speaking Harajuku girl with pink-blue braids, clear clutch & 6%DOKIDOKI tote bag.